SFTP Server ist ein leichtgewichtiger Hochleistungs-SSH-Dateiserver. Er ist so konzipiert, dass es einfach zu konfigurieren ist und gleichzeitig robuste Sicherheit und hohen Durchsatz bietet. SFTP Server is lightweight, high performance SSH File Server. It is designed to be simple to configure while providing robust security and high throughput. 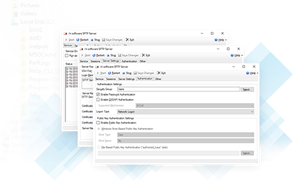 SFTP Server features a highly configurable yet easy-to-use interface which can be setup in minutes. SFTP Server is built on the rock solid core of IP*Works! SSH, which has provided industry leading SSH security and performance for over a decade. Easily configure an SFTP Server on any Windows Desktop or Server for instant Secure File Transfer capability. PowerShell Server supports all major SSH algorithms, AES and 3DES encryptions, FIPS 140-2 cryptography, and more. Use the intuitive interface to start hosting files within minutes. Users can be authenticated using integrated windows authentication or industry standard public key authentication. Easily visualize and disconnect sessions at the click of a button. Supports all modern algorithms including AES (CTR, CBC, and GCM), 3DES, Blowfish, SHA-256, ECDH, and more. File based or Windows based public key authentication. Runs as a Windows service or standalone desktop application. Granular control over advanced functionality including algorithms. Simple design makes hosting a snap.